When a solution containing copper ions is sprayed on plants, the copper kills fungi and bacteria by destroying plant protein. Copper fungicides are most often used when fruit trees are dormant. 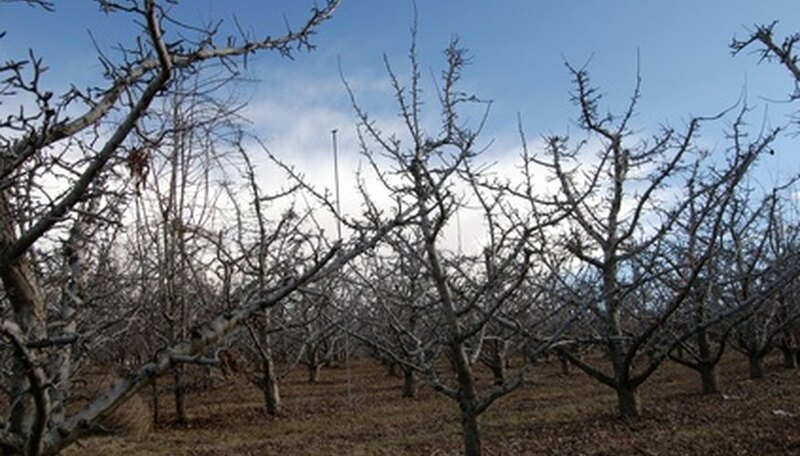 Applying too much copper fungicides or applying them in the growing season when unseasonably cold, wet weather slows drying increases the risk of damaging foliage and fruit. French vineyards originally combined copper sulfate, also known as bluestone or blue vitriol with hydrated lime to form what is called the Bordeaux mixture. The Bordeaux mixture is most useful as a spray when trees are dormant because it can withstand fall, winter and spring rains. Each mix is usually identified with three numbers representing the amount of copper sulfate in pounds, hydrated lime in pounds and gallons of water. A 6-8-100 has 6 pounds of copper, 8 pounds of hydrated lime and 100 gallons of water. You can buy Bordeaux mixture as a powder or make it yourself. A good Bordeaux mixture for use as a dormant spray is a 4-4-50 formula. Mississippi State University horticulturalists give this formula for one gallon: Dissolve 6½ teaspoons of copper sulfate in a pint of water. Do the same with three tablespoons of hydrated lime. Strain each of these through cheesecloth or cloth with a loose weave to remove particles that might clog sprayer nozzles. Put the two pints into a gallon container and fill it with water. Fixed copper fungicides are insoluble compounds containing copper oxychlonde sulfate, cuprid hydroxide or tribasic copper sulfate. They will not withstand winter rains as well as the Bordeaux mixture; they are more useful for spraying in the spring after the buds are broken and the leaves are exposed. Their use is limited because they are incompatible with other pesticides. Horticulturalists at Ohio State University recommend an 8-8-100 Bordeaux mixture to control fire blight and apple scab. Agitate this mixture constantly or it will jell and clog spraying nozzles. Do not apply after the buds show silver tip or leaves that are more than a quarter-inch long. Use a 50 percent powder of fixed copper in a spray to control fire blight. Apply beginning at 5 percent bloom and treat every five days until the blooming is finished. Use a Bordeaux mixture or spray that contains 50 percent copper in late autumn to protect against bud and twig infection of Coryneum blight and leaf curl. If the disease is severe or rain is heavy, apply again when the buds swell but before bloom.